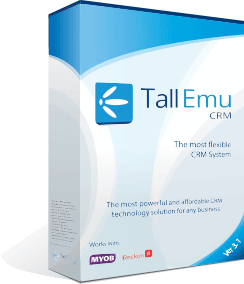 Tall Emu CRM revolutionises information access throughout your business. Increase sales effectiveness: the most productive lead sources and sales staff are clearly identified. Sales reports are real-time reports. Reduce administrative costs: information is only entered once – CRM, product catalogue, invoicing, customer service and sales history – all in the same database. Improve efficiency: everyone in the business knows right away where to find information without wasting time looking for it. Better management: easily understood and clearly presented information that makes the ups and downs of your business readily apparent so you can seize opportunities. Tall Emu CRM integrates all your customer data into one database. It includes your customers’ contact details, customer group status, activities, correspondence and other historic data. Any activities and data related to a particular customer can be tagged as required. This way you get a real time CRM system working for your business.